Seeing these dew-covered spider webs draped like sheets over boxwood lets us know we are in transition from summer to fall. On wet mornings, dozens of webs can be seen covering a multitude of box, other shrubs, grasses, and groundcovers like pachysandra. The sight could very well freak out arachnophobes. Sadly, some folks run for a can of insecticide or a broom or the garden hose to make them just go away. But they should let these spiders be! 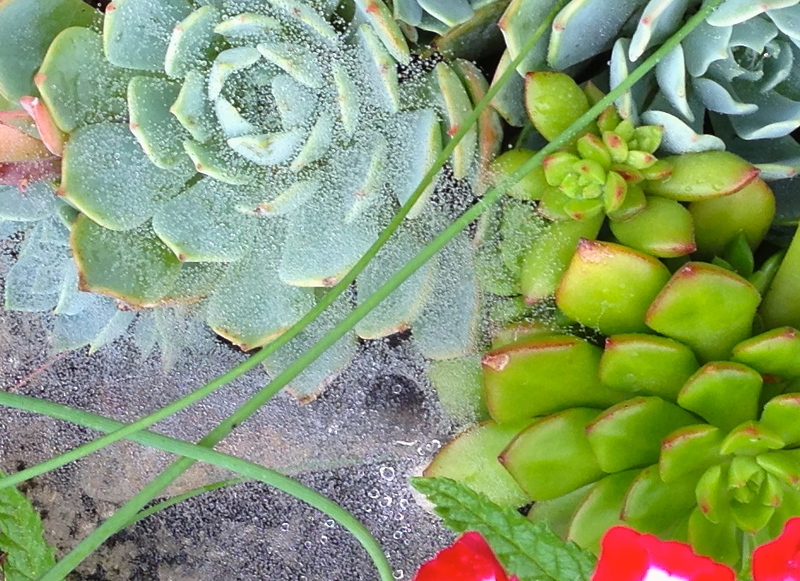 The webs and spiders aren’t harming a thing and the spider will help out in the garden by eliminating insect pests. We have to look hard to see the webs on a regular day but on a foggy morning or after an overnight dew, the webs stand out hortizontally over plants. It’s not a time to panic. It’s a time to marvel. Just look at the intricate architecture of each web. Amazing! And just wonder how long it took one female spider to spin such a web. I consider it a miracle of nature… really! 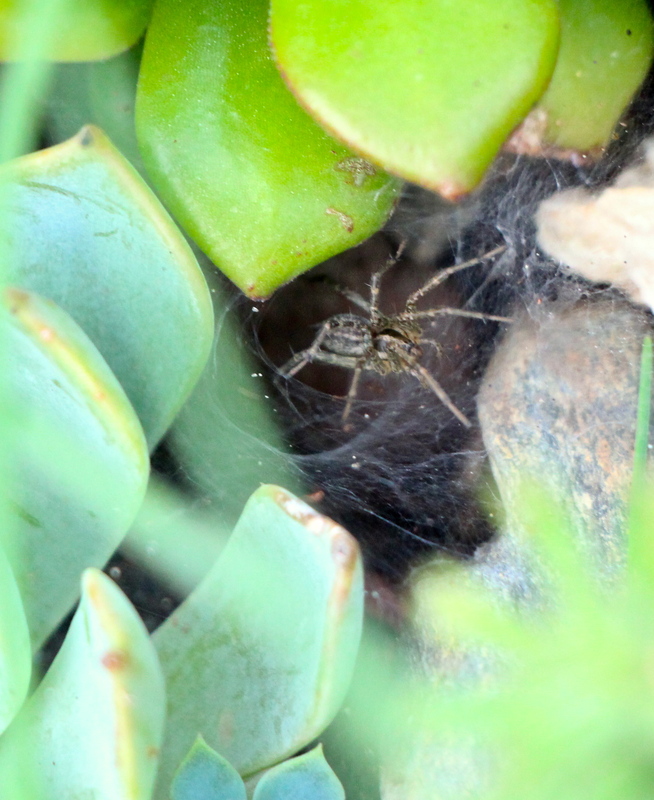 Some of the webs are large enough to connect several different plants and a flowerpot. Others are thin and sparse. Is this spider just beginning her construction or is she finished? Or perhaps she was caught up in the foodchain and no longer exists. Some of the spiders find a good location and build webs side by side… neighbors, you might say… with a wall of colorful hydrangea blooms separating them. Now we have to wonder who lives in these webs. The funnel on each web is a clue to her identity. Would you like to know who she is? She’s the shy spider from a group of funnel weavers called grass spiders (Agelenidae). When she feels a vibration, she dashes out of her funnel at lightning speed to capture her prey. Her web is not sticky so she must depend on speed. Winter is coming and the webs won’t be there forever. She’ll soon deposit her eggs in a sac and die. Her young will hatch in the spring and repeat the cycle, maturing to adulthood over the summer, mate, reproduce and die. Lately we’ve had temperatures in the high 70’s and low 80’s during the day and at night the temperature drops to a comfortable 65° and below. 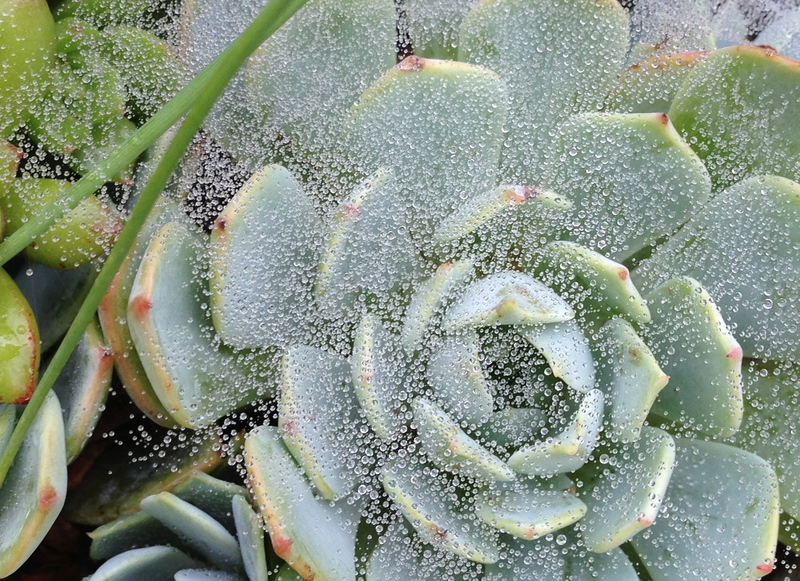 Those cool night temperatures bring the daytime water evaporation back to earth in the form of sparkling dew. I love a dewy morning if only to check out the variety of spider webs that festoon the trees, shrubs, grass and just about everything else: cars, mailboxes, doors. Webs that are next to invisible on a sunny day glisten like jewels on a dew laden morn. A Virginia friend made a small hypertufa planter for me and and it’s perfect for a few hens and chicks. 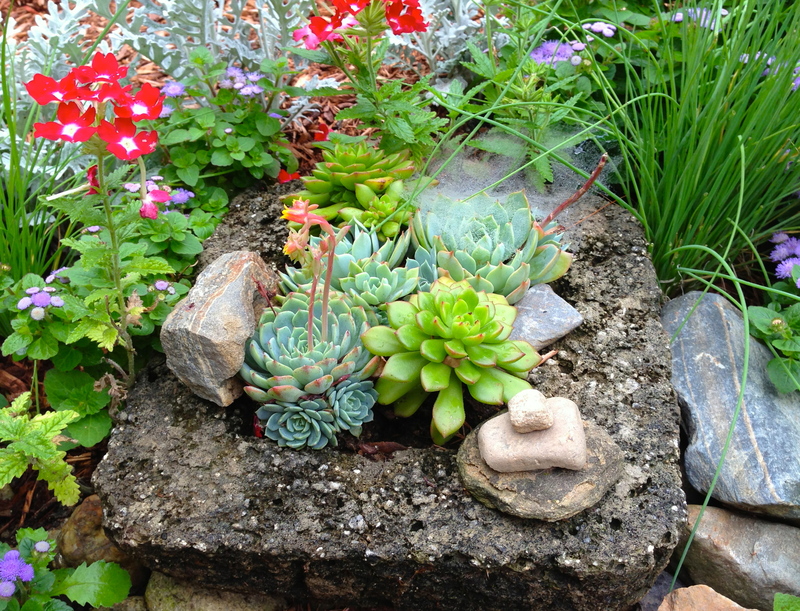 I put it in a hot and sunny spot just outside the door, threw in a few herbs and annuals nearby and let it go. This morning I spotted the dewy web draped like twinkling gauze over one corner. Let’s get a little closer to the miniature world of spiders. The spider is in there but not in this photo. Here is its hiding place, his funnel. Who is this little spider who wasn’t showing its face this morning? It’s a grass spider, Agelenopsis sp., a funnel weaver. The web it spins is not sticky to trap insects like the orb webs. Instead the grass spider depends on its incredible speed to nail their prey. Usually hiding inside its funnel, it will often venture out and sit in the opening. But this early morning must have been too wet for this spider so…. ….I stepped outside again after the sun was high to try and capture its picture. After waiting about a minute, out came our grass spider. Easily identified by the black and medium brown stripes on the cephalothorax and pattern on the abdomen, it’s one of over 400 species of funnel weaver spiders in N. America. These harmless spiders are seen more often in the late summer and fall…. and sometimes in our houses. This little fella looks to me like a female with her belly perhaps full of eggs. The adult males are much slimmer. With the extremely wet summer we are experiencing, I hope our gal catches her weight in mosquitoes daily!